Cerebrotech Medical Systems is an innovative medical device company focused on the development of portable neurotechnology solutions. When a patient is having a stroke, rapid assessment, triage and intervention can mean the difference between achieving full functional independence and living with permanent, debilitating brain function loss. 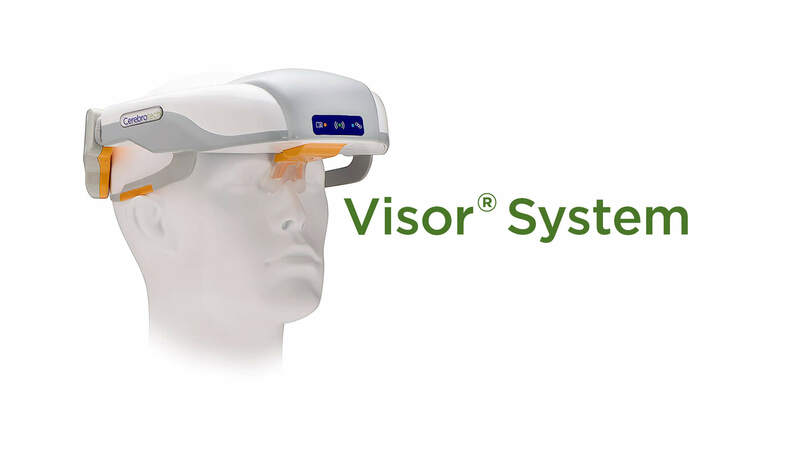 The Visor™ System is a noninvasive wireless device for assessing brain fluid distribution. The device uses low-power radio waves to detect bioimpedance asymmetry, including asymmetry associated with large acute ischemic stroke in patients undergoing neurologic assessment. In recent clinical studies, the Visor System has been able to differentiate large strokes from small strokes with high accuracy. Cerebrotech products are not available for sale. Our core technology, Volumetric Impedance Phase-shift Spectroscopy (VIPS™), provides real-time assessment of brain fluid distribution for patients undergoing neurologic assessment, allowing earlier intervention to prevent further brain damage. The technology passes low-power electromagnetic waves through the brain, detecting small changes and asymmetries in its electrical properties to aid neurologic assessment in about 30 seconds. Rapid assessment may lead to early intervention, better outcomes, and reduced hospital costs. VIPS technology has the potential to significantly improve patient outcomes and transform the paradigms for managing of life-threatening neurological events that can occur following serious neurologic conditions including stroke, traumatic brain injury, and brain surgery. The Visor System is a non-invasive wireless neurological device designed for use as an aid to clinical assessment in conjunction with current standards of care. Cerebrotech’s core intellectual property is licensed exclusively from the University of California at Berkeley. González, César A., and Boris Rubinsky. “Frequency dependence of phase shift in edema: a theoretical study with magnetic induction,” Engineering in Medicine and Biology Society, 2005. IEEE-EMBS 2005. 27th Annual International Conference of the. IEEE, 2006. González, César A., and Boris Rubinsky. “The detection of brain oedema with frequency-dependent phase shift electromagnetic induction”, Physiological measurement 27.6 (2006): 539. González, César A., and Boris Rubinsky. “A theoretical study on magnetic induction frequency dependence of phase shift in oedema and haematoma.”Physiological measurement 27.9 (2006): 829. González, C. A., R. Rojas, and B. Rubinsky. “Circular and Magnetron Inductor/Sensor Coils to Detect Volumetric Brain Edema by Inductive Phase Shift.” 13th International Conference on Electrical Bioimpedance and the 8th Conference on Electrical Impedance Tomography. Springer Berlin Heidelberg, 2007. Gonzalez, Cesar A., et al. “Inductive phase shift spectroscopy for volumetric brain edema detection: An experimental simulation.” Engineering in Medicine and Biology Society, 2007. EMBS 2007. 29th Annual International Conference of the IEEE. IEEE, 2007. González, César A., Liana Horowitz, and Boris Rubinsky. “In vivo inductive phase shift measurements to detect intraperitoneal fluid.” IEEE transactions on biomedical engineering 54.5 (2007): 953-956. González, C. A., and B. Rubinsky. “Remote Volumetric Detection System for Determining Tissue Water Content Properties: A New Concept Based on Magnetic Induction and Cellular Phone Technology.”IX Simposio Mexicano de Cirugía Asistida por Computadora y Procesamiento de Imágenes Médicas/ MEXCAS (2008). Rojas, R., B. Rubinsky, and C. A. Gonzalez. “The effect of brain hematoma location on volumetric inductive phase shift spectroscopy of the brain with circular and magnetron sensor coils: a numerical simulation study.” Physiological Measurement 29.6 (2008): S255. Flores, Omar, Boris Rubinsky, and César A. González. “Experimental sensitivity study of inductive phase shift spectroscopy as non-invasive method for hypoperfusion vs bleeding volumetric detection in brain.” Engineering in Medicine and Biology Society, 2008. EMBS 2008. 30th Annual International Conference of the IEEE. IEEE, 2008. Blumrosen, Gaddi, B. Rubinsky, and C. A. Gonzalez. “New wearable body sensor for continuous diagnosis of internal tissue bleeding.” Wearable and Implantable Body Sensor Networks, 2009. BSN 2009. Sixth International Workshop on. IEEE, 2009. Gonzalez, C. A., et al. “The detection of brain ischaemia in rats by inductive phase shift spectroscopy.” Physiological measurement 30.8 (2009): 809. González, César A., Gaddi Blumrosen, and Boris Rubinsky. “Remote Monitoring of Internal Bleeding Based on Magnetic Induction and Cellular Phone Technology: A Potential Application in Poor Regions in México.” Test journal 14.2 (2010). González, César A., et al. “Over-hydration detection in brain by magnetic induction spectroscopy.” Journal of Physics: Conference Series. Vol. 224. No. 1. IOP Publishing, 2010. Blumrosen, Gaddi, et al. “Exploitation of electromagnetic radiation properties for medical diagnostic.” Microwaves, Communications, Antennas and Electronics Systems (COMCAS), 2011 IEEE International Conference on. IEEE, 2011. Laufer, Shlomi, Stephen B. Solomon, and Boris Rubinsky. “Tissue characterization using electrical impedance spectroscopy data: a linear algebra approach.” Physiological Measurement 33.6 (2012): 997. Gonzalez, Cesar A., et al. “Volumetric Electromagnetic Phase-Shift Spectroscopy of Brain Edema and Hematoma.” PloS one 8.5 (2013): e63223. Atefi, Seyed Reza, et al. “Stroke Damage Detection Using Classification Trees on Electrical Bioimpedance Cerebral Spectroscopy Measurements.” Sensors 13.8 (2013): 10074-10086. There is a critical, highly-visible unmet need for effective, accurate pre-hospital stroke triage in ambulances and emergency rooms, to distinguish between the different types of stroke. Early identification of large vessel occlusion (LVO), a specific type of stroke, will allow patients to be transported directly to a specialty stroke center for intervention to restore blood flow to the affected portion of the brain, and enable each patient to receive the optimal care for their needs. Mr. Dieck has co-founded and held senior management positions in four neuro-interventional companies, all of which were acquired by Medtronic, Covidien or Stryker. Currently Mr. Dieck is Chairman of Synchron, Inc. a neuro-interventional company developing a minimally invasive brain machine interface. Mr. Dieck was co-founder, Chairman and CEO of Lazarus Effect, which developed a next-generation stroke treatment device and was sold to Medtronic in 2015. He previously served as CEO and board member at Nfocus Neuromedical, and Concentric Medical. As a venture investor, Mr. Dieck was an Executive Director at DFJ-ePlanet and ePlanet Capital where he had direct responsibility for the med-tech portfolio. This portfolio included BodyMedia (sold to Aliphcom / Jawbone), Spinal Modulation (sold to St Jude Medical), Zonare (sold to Mindray), DirectFlow and Intrapace. Mr. Dieck is an inventor with over 30 issued and pending patents. He received his BA in Biological Sciences from Willamette University and MBA from the University of California at Berkeley. Mr. Levinson is a start-up medical device executive with over 30 years of experience developing and bringing revolutionary new products to market. Mr. Levinson started Cerebrotech Medical Systems in 2011 based on a technology developed at UC Berkeley. Mr. Levinson was the start-up President and CEO for Zeltiq Aesthetics (ZLTQ), and led the development of the groundbreaking cooling technology for non-invasive fat layer reduction. Prior to Zeltiq, Mr. Levinson was the start-up VP of R&D at Thermage, which utilizes radiofrequency energy to provide non-invasive skin tightening. Thermage held its IPO in 2006, and is now part of Valeant Pharmaceuticals. Mr. Levinson was also VP of R&D at BioSurgical Corporation, developer of a novel applicator for fibrin sealant, acquired in 2000 by Baxter International. Mr. Levinson has led the development of breakthrough products at Nellcor (patient monitoring), Baxter (in vitro diagnostics), ALCOA Intercon-X, and Hewlett Packard. Many of Mr. Levinson's innovations are represented in his 45 issued U.S. patents with more pending. He earned his B.S. in Engineering Sciences from University of California at San Diego and also holds a MS in Computer Systems from University of Phoenix. Dr. Laden co-founded TriStar Technology Ventures in 2009. Through his role at TriStar, he serves on the Board of Directors for Cerebrotech, NuSirt, Molecular Sensing and Diagnovus, and oversees TriStar’s interest in BioStable, TVA and GenomOncology. Prior to the founding of TriStar, Dr. Laden served as the Assistant Director in the Office of Technology Transfer and Enterprise Development at Vanderbilt University. Dr. Laden holds a doctorate in Toxicology from the University of Kentucky, a master’s degree in Environmental and Industrial Health from the University of Michigan and an undergraduate degree in biology from Penn State University. Issie N. Rabinovitch is a partner at Cheyenne Capital, a venture capital firm, and sits on multiple boards of directors for his portfolio companies. Mr. Rabinovitch was the Chief Executive Officer of Mainsail Networks, a telecommunications company. He served as President and CEO of Micro Power Systems, Inc., a semiconductor products company. Mr. Rabinovitch was President of Berkeley International Capital Corporation, a venture capital firm, was President of Crowntek Software International, a software development and distribution company, and was at Xerox in various management roles. Mr. Rabinovitch holds a B.S. from McGill University and an MBA from Harvard. Mr. Cook co-founded Mountain Group Partners in 2002. In addition to Cerebrotech, Mr. Cook currently serves on or has visitation rights to the board of directors of: Castle Biosciences,Lineagen, and MiNDERA. Mr. Cook previously served on or had visitation rights to the board of directors of: ABT Molecular Imaging, Clearside Biomedical (NASDAQ “CLSD”), Pathfinder Therapeutics, VenX, Diagnovus, and OnFocus Healthcare. Prior to his involvement with MGP, Mr. Cook was a Director, Private Placements in the Investment Banking Group of Robert W. Baird & Co., and was Vice President in the Investment Banking Group at J.C. Bradford & Co. Mr. Cook graduated with a B.A. in Economics from Davidson College. Mitch Levinson will be speaking to entrepreneurs, investors and regulators at ComplianceOnline conference in San Diego on September 17, 2015. Cerebrotech’s Intracranial Fluids Monitor is a key element of this study, as the company collaborates with world-class researchers from academia, NASA (thru NSBRI) and the German Aerospace Center (DLR). Baylor Innovations highlights VIPS technology as a “game-changer”, according to Baylor University Medical Center department chair, Dr. Michael Foreman. Announcement: Are Sideline Brain Scanners About to Become a Reality? Cerebrotech inventor and co-founder, Boris Rubinsky, expects his technology will be useful in detecting concussion. University of California researchers describe results from Mexico study on TBI patients. UC Berkeley researchers discuss new brain monitoring technology. Cerebrotech is selected from dozens of applicants as the recipient of the 2013 SmartCAP grant from the National Space Biomedical Research Institute in Houston. Nashville healthcare venture firm TriStar Technology Ventures makes significant investment in start-up Cerebrotech Medical Systems. Copyright © 2019, Cerebrotech Medical Systems, Inc. All rights reserved.